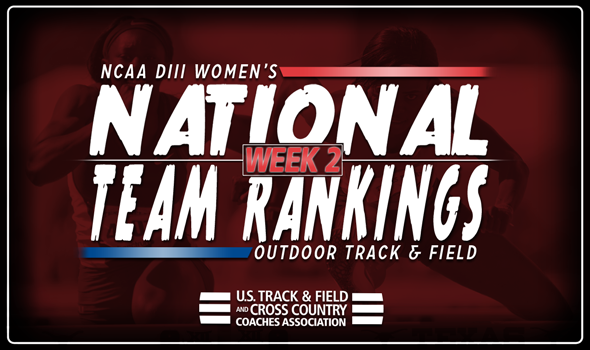 NEW ORLEANS – Minimal changes befell the NCAA Division III Women’s Outdoor Track & Field National Team Rankings between Week 1 and Week 2. The most recent rankings, which were released Tuesday by the U.S. Track & Field and Cross Country Coaches Association (USTFCCCA), saw four out of the five teams in the top-5 remain in place, including No. 1 Williams, No. 2 Claremont-Mudd-Scripps, No. 3 George Fox and No. 4 Washington (Mo.). The first notable alteration to the index was Ithaca moving up three spots from No. 8 to No. 5. This is the seventh time in the past two years that the Bombers have been ranked in the top-5 and they moved up this week thanks to the efforts of their 4×100 relay team. Ithaca’s quartet moved into the top-15 nationally. Another team with a three-spot jump was Nebraska Wesleyan, as it went from No. 14 to No. 11. The Prairie Wolves received a tremendous effort by Dayton Dolincheck in the shot put this past weekend. Dolincheck heaved the orb 14.14m (46-6¾) to take over the No. 8 spot on the USTFCCCA Individual Rankings. That is one of six top-10 marks NWU owns this season. Further down in the rankings, Redlands jumped four spots from No. 24 to No. 20 and Bates climbed from No. 38 to No. 22. The Bobcats were buoyed by Katherine Cook, who clocked what is now the fourth fastest time in the USTFCCCA Individual Rankings in the 5000. Be sure to check back throughout the season as the National Team Rankings continue to evolve ahead of the 2018 NCAA Division III Outdoor Track & Field Championships, which will be held May 24-26 in La Crosse, Wisconsin.